Over fifty years ago, a Nebraska-born entrepreneur settled in Santa Barbara, CA. This young Nebraskan cowboy dreamed of striking it rich. So like so many young men before him, he headed west with his high school sweetheart. Nestled in the mountains, he stumbled upon 120 acres of sprawling land filled with streams, waterfalls and picturesque views outside Santa Barabara, California. It was here that Hidden Valley Ranch was born. The family bought the land in 1954 and ran Hidden Valley Ranch, offering hiking tours, horseback riding and fishing, in the day. At night, folks would enjoy a home-cooked meal before gathering around the campfire to listen to stories. Guests came to enjoy the great outdoors and wholesome meals, but it was something else that made them come back: the delicious, homemade buttermilk salad dressing with a special blend of herbs and spices lovingly prepared by the proprietor — what we know today as the original Ranch dressing. Guests loved it, asking for jars to take home for family and friends to try. Soon there was so much demand for the dressing that a mail-order business began by shipping Hidden Valley Ranch dressing out to an ever-growing fan base. Who knew that Hidden Valley® Ranch dressing, a mix of herbs, spices and buttermilk whipped up back in the ‘50s would grow to sell throughout the United States and eventually in more than 30 countries? Ranch has become America's favorite dressing and can be found in virtually every restaurant these days. It is enjoyed on everything from salads and vegetables to pizza and fried chicken. Today, you can still enjoy the taste of Original Ranch with its perfect blend of herbs and spices and also try great new flavors born from our rich heritage. In large pot, cook ground beef over medium heat, season ground beef with salt and pepper, cook until no longer pink. Add onions, stir, cook about 3 to 4 minutes. Add remaining ingredients except garnish. Simmer for 20 to 25 minutes. Enjoy! This sounds good Christine. A gluten free recipe with green chilies sets it off just right or am I reading it wrong. I never even thought about the origin of ranch dressing. I'm going to think about this history every time I encounter it now. This sounds delicious, Christine. What a great way to get that taco flavor and still eat nice warming soup in the Winter. Isn't it amazing! I remember when there was no Ranch dressing and now it's the most popular dressing around! looks delicous and happy holidays to you and yours! 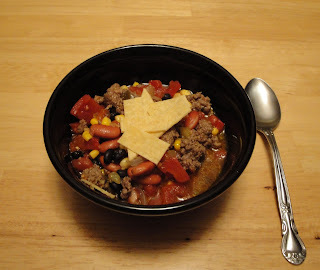 Tacos are probably one of my favorite foods and I love the idea of making it into a soup! It looks soo good! :) Great recipe! Congrats on making Today's Top 9! What a great tidbit of knowledge, love it! Soup looks delicious-thank you for sharing! Thank you everyone for all the wonderful comments. I hope you try this soup, so good. Your soup looks so delicious. I'll have to try this one soon. Ranch is my favorite dressing. I couldn't imagine a world without it. Thank you Becky, I hope you enjoy! Congrats on Top 9 Christine, long overdue. Hope you and your family have a Merry Christmas. That looks delicious and hearty, plus easy enough for a weeknight. Thanks for sharing. I really really love this comfort food soup. Hidden Valley Ranch has got to be one of those secret ingredients. I mean, it's just so good it elevates everything! Thank you Cathy! I hope you enjoy.